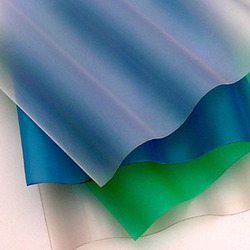 Our product range includes a wide range of frp sheets and frp corrugated sheet. FRP Sheets are light in weight and easy to use in any application. These sheets are used for roofing purpose in residential, hotels and hospitals etc.They are supplied using supreme quality raw material and estimated for its high flexible strength, easy maintenance and longer durability. We provide service which are available affordable price range and customized designs. We are the leading manufacturers of FRP Corrugated Sheet.